WHOLESOME SNACKING: Crispy Chews are pressed fruit & veggie snacks made with crispy brown rice and a FULL SERVING of real fruits & veggies! The soft, crispy chewy texture, bite-sized pieces, and single-packet portions make them the perfect toddler snack. CLEAN INGREDIENTS: Sprout's snacks are made only with USDA Certified Organic & Non-GMO ingredients, never anything artificial! And unlike other baby food brands, Sprout's baby food and toddler snacks contain no added Flavors, Colors, or Preservatives. TRUE VARIETY: Sprout has organic baby snacks & toddler snacks for every stage of development - gentle teething wafers, quick-dissolve Quinoa Puffs, Crispy Chews fruit & veggie snacks, and crunchy Plant Powered toddlers snacks like Curlz and Crinklez. SPROUT COMMITMENT: Sprout is committed to providing delicious and nutritious organic baby and toddler food to your family. Sprout's baby food pouches, toddler food pouches, and toddler snacks are made from the cleanest & safest ingredients. 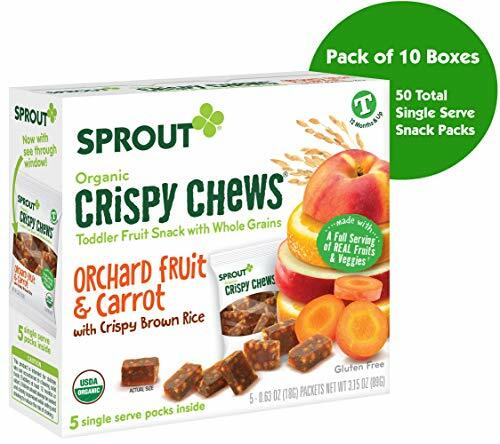 SPROUT PRODUCTS: Try Sprout Organic Crispy Chews and other Sprout organic baby snacks & toddler snacks if you've tried products from Happy Baby, Happy Tot, Plum Organics, Annie's, Gerber, Beechnut, Peter Rabbit, Mama Bear, or Earth's Best. Final Price as low as $23.26 Shipped!